-- Select a Size -- Small - Out of Stock! Large - Out of Stock! Help inform the public about your dog's "in training" status without saying a word. 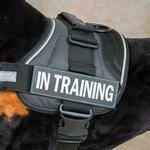 Alert others that yours is a working dog with the EzyDog Convert Harness Custom Side Patches. Dogs won't be misidentified with these custom patches on their EzyDog Convert Dog Harness. By letting the public know that your dog is in training, they'll know to let your pup focus on their tasks. The "in training" dog harness patches are great for dog trainers doing work with an animal in a public place. Not only is this designation helpful for professional dog trainers, it can also help the average dog owner notify others that their dog is working on his or her skills and needs the space to do so. Designed to work with our EzyDog Convert Harness, you simply exchange whatever patch you need with the quick-touch fastener backing. Patches are sold in a set of 2. Harness sold separately. Caution: Owners of dogs impersonating genuine service animals may be subject to fines, jail time and/or confiscation of said animal. Posted On 04/21/17 by Bobbijo M from , CA Yes, Bobbijo M recommends this product! I have searched everywhere for this patch and the prices were ridiculous but I was able to buy it here for an amazing price and it's perfect! Posted On 10/23/15 by Wanda Marie from Hill Country, TX Yes, Wanda Marie recommends this product! The "In Training" patches say it all when it comes to my young Beabull who is currently in obedience training classes. Posted On 03/26/15 by Maltipoo from Irvine, CA Yes, Maltipoo recommends this product! These patches are really well made and easy to read. Posted On 11/08/14 by PupDawg from Boston, MA Yes, PupDawg recommends this product! The Convert is my new favorite harness and I love that it can be customized. The "In Training" patch helps when we are in public to let others know we are working on behaviors and they tend to not interrupt or first ask rather than just approach and greet my dog. I hope BaxterBoo will carry the full range of patches and the saddle bags for the Convert to use it as a backpack in the future! Great sale and coupons! Wish the cubs hat was in stock.